The ermine is both predator and prey. The black tip on its tail confuses predators like owls and hawks who might lunge for the black spot and miss capturing this tiny creature. I have spied on ermine from the chairlifts at Steamboat ski area. I always see their wiggly tracks in the snow and sometimes see them hunting or listening for hidden mice. Cute but deadly—a fascinating combination. The stone is Sivec (sa-VETCH) marble from Greece. (Actually, the quarry is in Macedonia, just north of Greece.) This stone has been quarried and carved for millennia into sculptures, plazas, temples, and palaces. The crystal is a bit larger than Carrara and a bit smaller than Yule, and sparkles like snow. Unlike the other white marbles, Sivec has no vein—just pure white. It does have small areas of larger crystal, which gives the stone an elegant and very subtle interest. 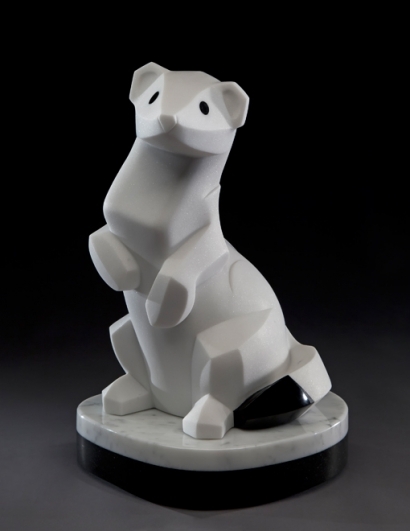 Pure white stone may be too harsh for human figurative sculpture, but it works perfectly for furry white animals! The eyes and tail of White Lightning are made from Mongolian Imperial Black Marble and create a stunning contrast. The Sivec is sanded to 180 grit and the Mongolian is finished to 10,000 grit with black rouge. I love how each stone can be finished to bring out beautiful qualities of that particular stone. Mongolian at 180 grit is medium gray. Sivec at 10,000 grit looks like white plastic. I designed the pose of White Lightning with counter-balanced angles to invoke the ermine’s wiggly way of moving and to create flat and curved surfaces for the play of light and shadow. The stone sculpture is mounted on a split base of Carrara marble to resemble woodland snow with flecks of twigs and pebbles, and black granite to tie in the black eyes and tail to complete the composition. The tactile quality of stone is difficult to explain—like trying to describe music or color with words. Sparkling white and shiny black finishes are compelling, and the variety of curves, angles and forms are most satisfying to see and touch. My goal with this piece was to have the sculpture pack an aesthetic whollop equal to that of the little ermine.